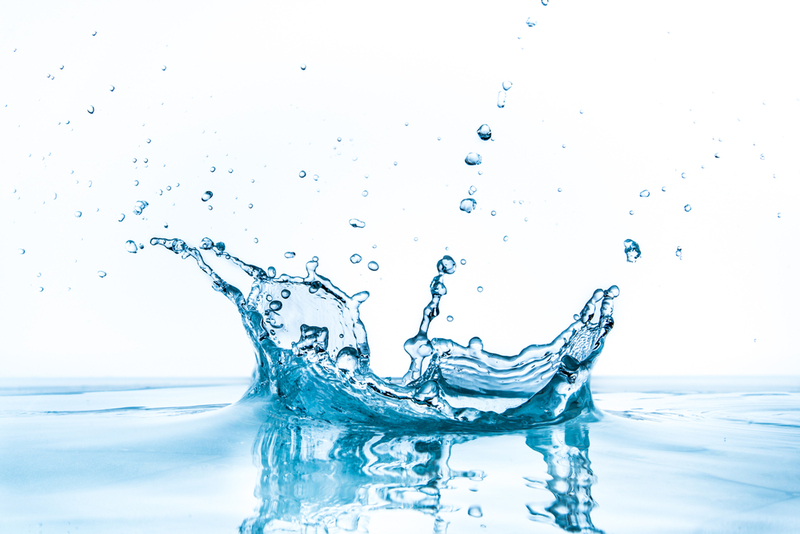 Surfactants — or “surface active agents” – are cleaning agents that lower the surface tension between non-dissolving liquids, or between liquids and solids. Surfactant compounds live on the edge, so to speak: they’re attracted to the boundary between substances, which makes them uniquely effective at penetrating, emulsifying and dispersing contaminants. 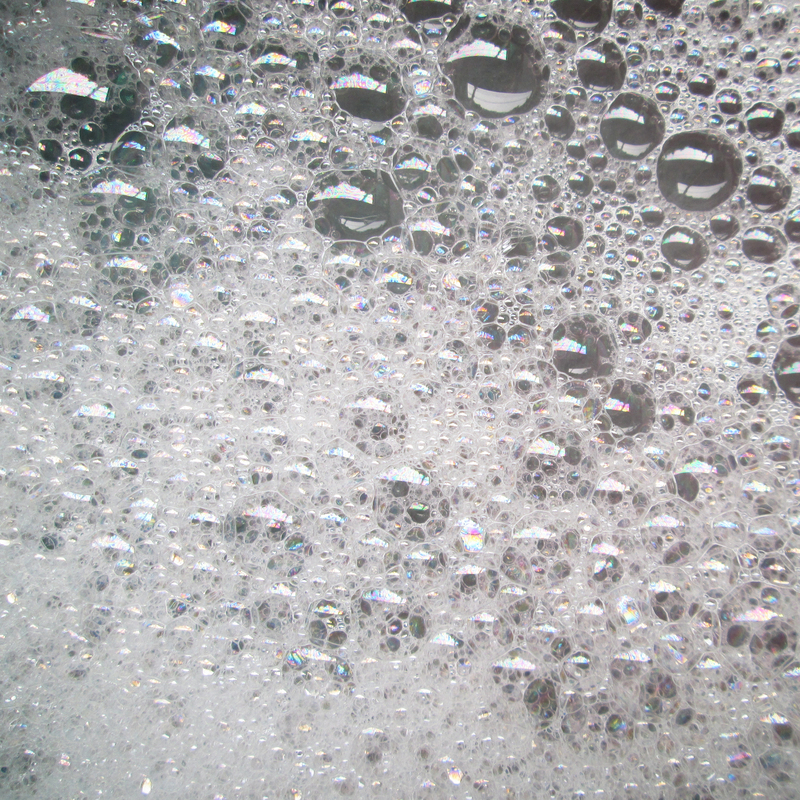 Surfactants are what make products like soap, detergent and sanitizers work so well. And surfactants are the key ingredient in any footbath protocol. AgroChem, Inc. has just improved HoofMax®, adding an advanced surfactant that helps to prepare the surface of the hoof so that copper ions can penetrate and adhere to the horn. This latest innovation makes more copper available to kill pathogens and help harden hooves. AgroChem has also added a new, dark-blue dye to make it easier to identify the product in the container and footbath. Early field reports are already saying that new HoofMax cleans better than the original. If you’re a HoofMax customer, let us know what you think of the new formulation! Hairy Heel Wart (Digital Dermatitis) vs. Foot Rot: What’s the Difference? Digital Dermatitis (Hairy Heel Wart) and Interdigital Phlegmon (Foot Rot) are separate diseases, but it can be easy to confuse the two. Both cause lameness, impacting yield, fertility and longevity. Both are caused by bacteria, which thrive—and spread—in muddy, dirty, damp conditions. Both leave your animals shifting from foot to foot seeking relief, if standing at all. And both can cost your operation hundreds of dollars per cow each year. 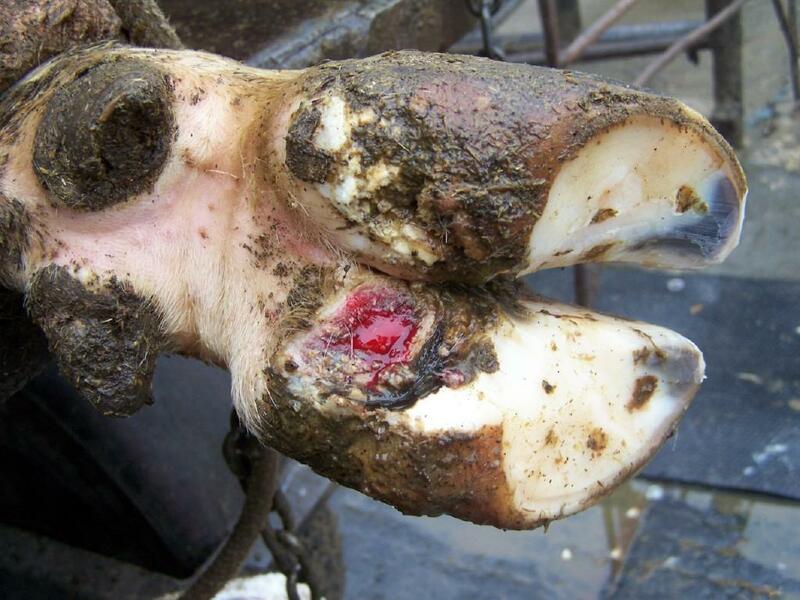 Yet hairy heel wart and foot rot are distinctly different hoof conditions, requiring distinctly different treatments. Here’s how to recognize what you’re dealing with, so you can fight back appropriately. Look for: initially a raw, painful, reddened area, rimmed with erect or matted hairs. Develops into a wet, gray lesion that, later, appears distinctly wart-like and may be ringed by hair-like projections. Most commonly affects the back of the hoof between the bulbs of the heels, can also spread around the foot and into the cleft between the claws. Usually no swelling or fever. Active, painful lesions require immediate treatment. First, clean affected areas with a stiff brush and soapy water, then rinse and dry. Follow with topical antiseptic therapy, such as HealMax® by AgroChem Inc. No foot wrap is necessary if using HealMax Wart Spray; however, if using other HealMax products, a light wrap may be applied. Look for: sudden onset, usually in one limb. Reddened tissue above the hoof and between the rear claws. 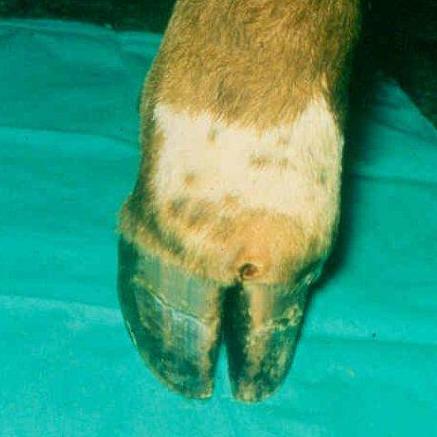 Acute swelling of interdigital tissues and around the hairline of both hooves. Fever usually present. Foul-smelling discharge, toes possibly spread outward. Untreated, swelling may progress upward from the foot. Very mild cases may respond to cleaning and topical therapy alone. In most cases, treatment requires veterinary supervision, using systemic antibiotic therapy that does not affect milking or require a milk withdrawal period. Fortunately, both conditions can be managed with a regular footbath program following recommended protocols for producers using copper or zinc sulfate footbaths, HoofMax® from AgroChem Inc. increases copper/zinc potency and promotes proper hoof hardness, which helps combat most forms of infectious hoof disease. For those operations favoring biodegradable hoof care solutions, HealMax®products provide an economic means of treating and preventing digital dermatitis without harsh acids or formaldehyde. For more information on preventing and treating costly hoof conditions in your herd, contact your hoof trimmer or veterinarian today. Fo otbaths have become a staple in dairy operations looking to treat or prevent infectious hoof diseases. But when a footbath becomes dirty or diluted, it provides no benefit and may even create additional problems. Some producers have incorporated a pre-wash into their hoof hygiene program; others aren’t sure they’re worth the time and trouble. Here are some of the most common questions regarding the use of a pre-wash in a hoof health protocol. 1. What is the purpose of a pre-wash? A pre-wash is used primarily to minimize manure contamination of the footbath in cows with poor leg hygiene. This may help the footbath remain active longer because there is less organic matter to neutralize the cleaning agents. 2. Where should the pre-wash be located in relation to the footbath? A pre-wash is most effective when it is located at least six to ten feet from the footbath, and is placed in the return lane at least two-thirds of the way down from the milking parlor. 3. What are the components of a pre-wash? Some hoof experts believe a pre-wash should be just water. Others favor a soap-and-water mixture. If using a soap-and-water mixture, use one pint of dishwashing soap to every 25 gallons of water. Care must be taken to prevent slippery conditions for cows. 4. How frequently should a pre-wash be changed? Depending on the cleanliness of the environment, a pre-wash may need to be changed at least as frequently, if not more so, than the footbath itself. While some operations with excellent leg hygiene may only need to run a pre-wash and footbath once a week, others may need to use it every day. According to University of Vermont researchers, footbath agents such as copper sulfate and formaldehyde should be changed every 120 to 200 cow passes. 5. Why would someone not use a pre-wash? Space may be an issue, as there might not be enough room near the footbath to accumulate a pre-wash. Water from the pre-wash may end up diluting the treatment chemicals in the footbath, requiring the footbath to be changed more frequently. Once the cow reaches the footbath, her hoof skin may not absorb the treatment solutions as readily as when it is wet. Using a pre-wash may contribute to water that will accumulate in the manure lagoon. Research also indicates that when a pre-wash is used, a cow may be up to four times more likely to urinate and defecate in the footbath, thus rendering it ineffective. 6. How does the use of chemical footbath additives impact the need for a pre-wash? In dairies that use copper sulfate footbaths, adding chemicals that increase the potency of copper sulfate may reduce or even eliminate the need for a pre-wash altogether. Organic matter such as manure and urine generates hydroxide ions that bind to – and neutralize — copper ions in the footbath. Chemical additives interrupt this process by binding to the hydroxide ions, leaving fewer of them available to bind to copper ions. More copper ions are therefore available for killing pathogens and promoting hoof hardness, significantly extending the life of the footbath – with or without a pre-wash.
Footbath additives are available in liquid, dry or concentrate forms, but all essentially do the same thing: allow the producer to achieve the same level of activity with substantially less copper. Some producers have been able to reduce copper usage by up to 80 percent when using a chemical additive in their footbath program. Secondary benefits include reducing copper loading on land, reducing the cost of the footbath program, minimizing corrosion issues caused by copper sulfate, and improving the overall safety of the footbath. If using a copper extending additive it’s important to use one that is properly buffered to reduce corrosive effects to skin and concrete. Producers who like the idea of a pre-wash for hygiene reasons will find the use of a pre-wash in conjunction with a chemical additive further extends the life of their footbath. Those who prefer not to go to the trouble and expense of a pre-wash will appreciate the ability of an additive to keep right on working even in the presence of organic matter. Because environmental conditions vary widely from herd to herd, always consult your hoof trimmer or veterinarian before making any changes to your hoof care protocol. This article by Dale Baker appeared in the April 2014 issue of DairyBusiness East.